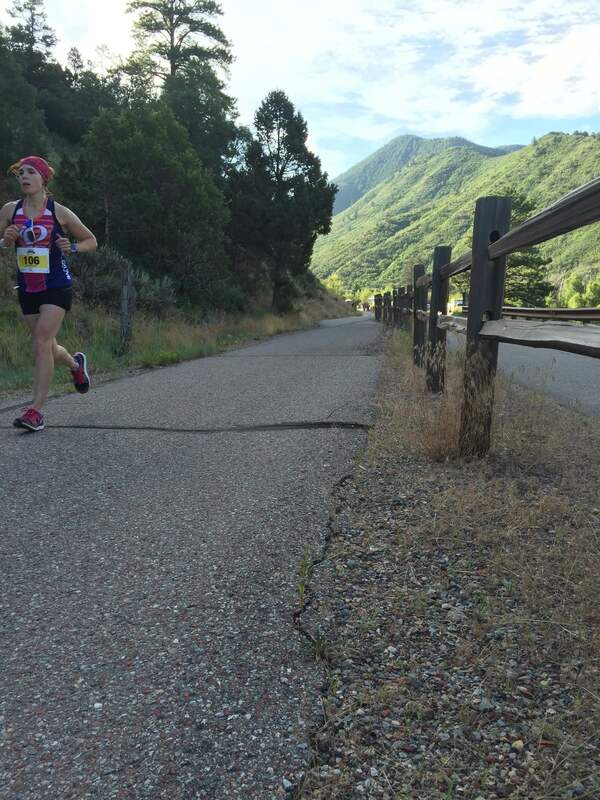 I ran the Aspen Valley Marathon on July 18th, about ten days ago. I started training for it just after Boston around the beginning of May. From what I had read about the race online it looked like a nice, gradual 20-mile descent followed by a potentially heinous 6 mile out and back. 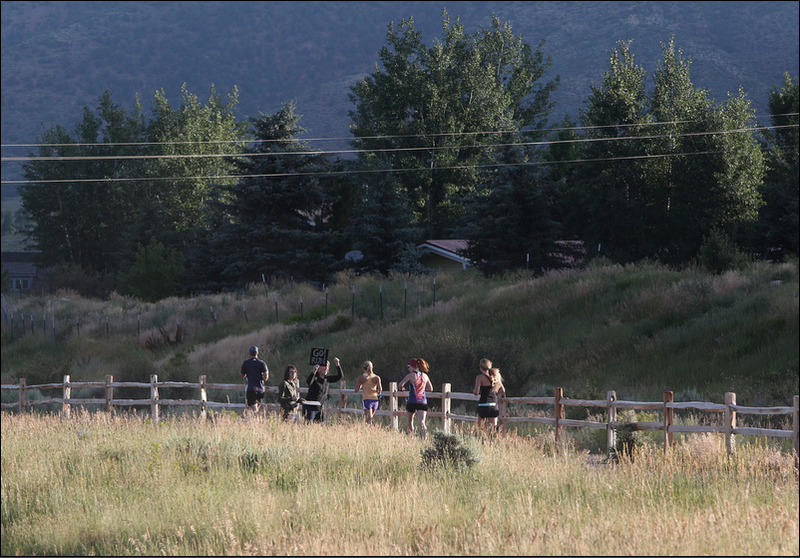 The reviews and pictures portrayed a beautiful run down the Rio Grande Trail from Aspen to Basalt. I figured the last 6 miles would be tough, but overall the race would be beautiful and fast so it wouldn’t matter. So, I had planned to shoot for a 3:25 time goal on this marathon because in the four other marathons that I have run, I have had too much energy left at the end of the marathon; it just seemed like I had more to give so I decided to increase my speed. 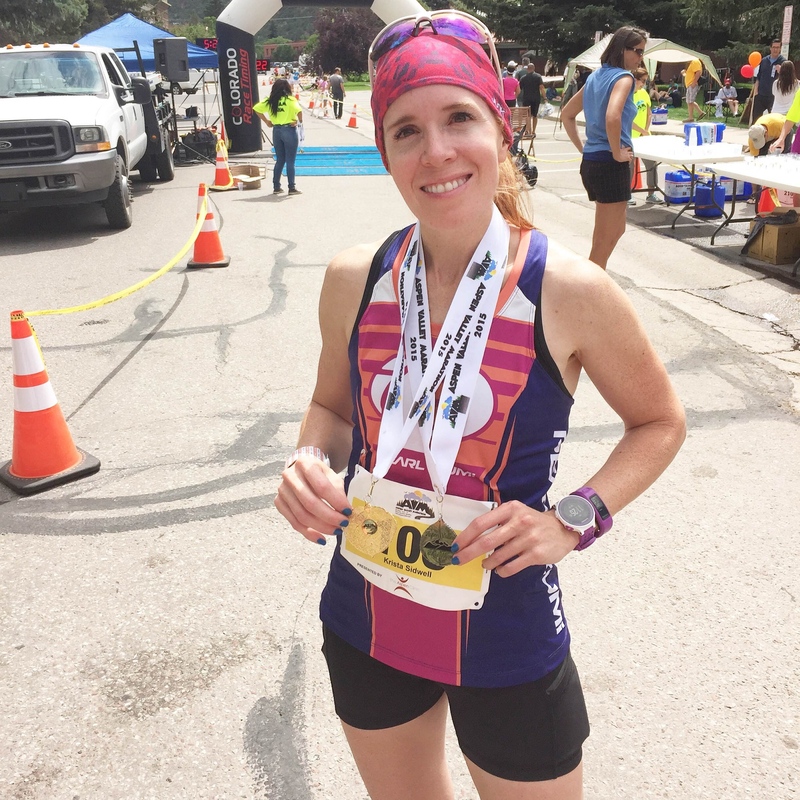 I completed the Boston Marathon at a 3:30 with headwinds and rain so I really felt like 3:25 was an attainable goal for Aspen especially with 2.5 months to train. About midway through my training, I discovered I had been running my strength workouts faster (7:08 per mile pace) than necessary for my goal and as a result, my tempo runs at the 7:47 pace felt too easy. 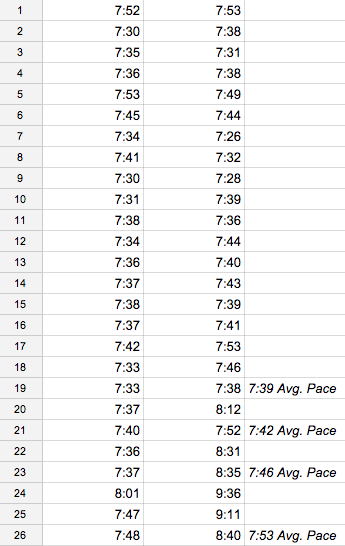 But, I felt good running the 7:08 strength pace so I decided to adjust my marathon goal pace to 7:41. Training at that pace felt challenging but not too challenging and as the weeks went by, I felt ready for the race. I purchased a pace band from FindMyMarathon.com for a 7:39 pace, or a 3:21 finish time, to give me a little bit of wiggle room for water breaks etc. Going into the race my goal was to finish at a 3:25 or faster and if I could somehow pull off the 3:21, great! The Monday before the race I started carb loading–300 grams per day. (I typically start about 3-4 days before, but felt I should start sooner for this race.) By Friday, I was feeling way too weighed down. Too many carbs. My bowels were moving very slowly. When my system gets slow like that, I really like taking some Magnesium Serene to help get it moving. It naturally/gently helps lighten my system before a race. Usually. So I took some early Friday morning. Here is where things really started to go wrong. We started our drive to Aspen and I was hydrating with water and G2 and snacking on carb-rich foods and my stomach was just not happy. It wasn’t hurting, but it was NOT normal. We were stopping regularly to use the bathroom–I was like a jockey before a race if you know what I mean. I was losing everything I was putting in. By the afternoon, I was really worried. I hadn’t been able to really keep anything in my system all day and had lost a ton of fluids. Not good. The day before a marathon you need your calories and you need your water and electrolytes. Nerves coupled with my dose of magnesium and 32 ounces of G2 had not been a good combination. Lesson learned. Will NEVER do that again! 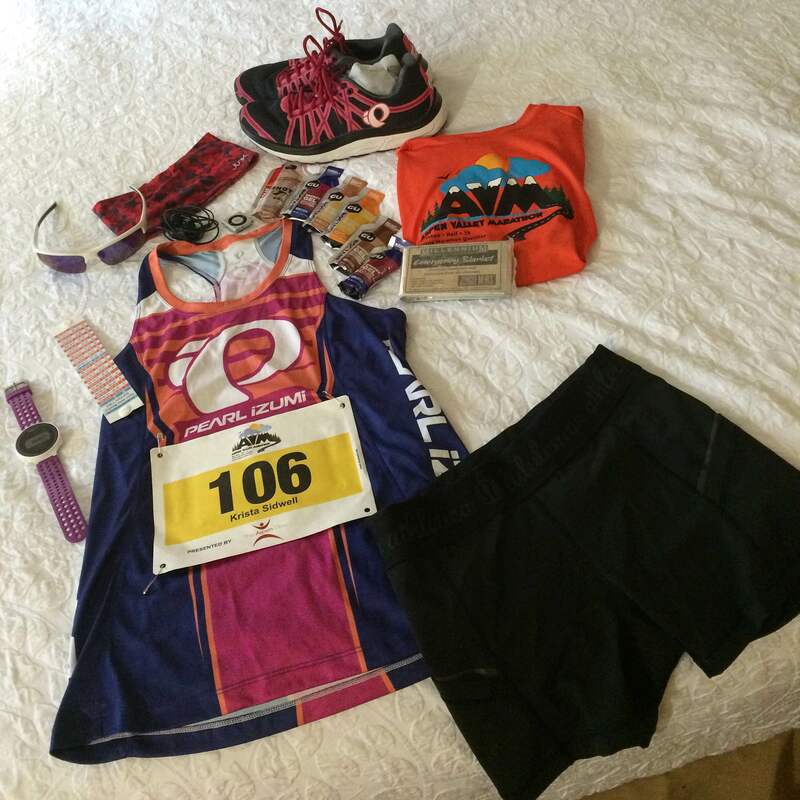 Laying out my clothes the night before the race. 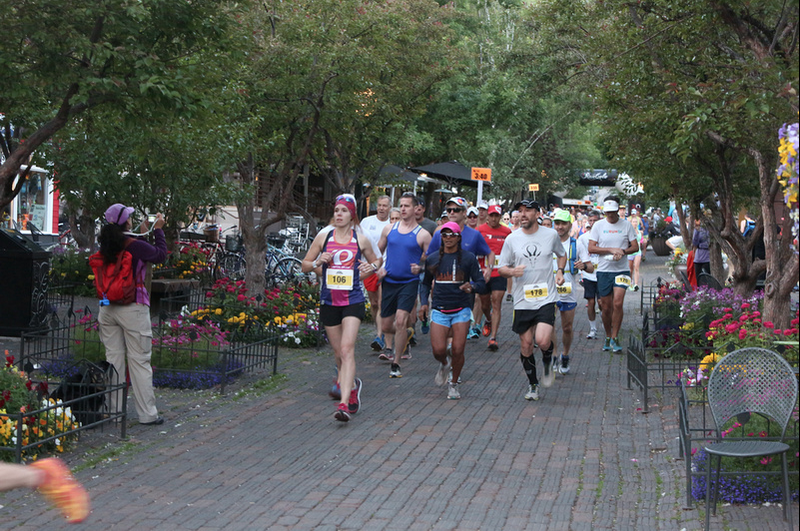 The Aspen Valley Marathon was the most laid back race that I have experienced thus far. Being a smaller race, the fastest pacer was pacing for a 3:40 finish, so I was on my own. We started running at 6:00 am. The sun was bright and it was already 54 degrees so it didn’t feel cold. 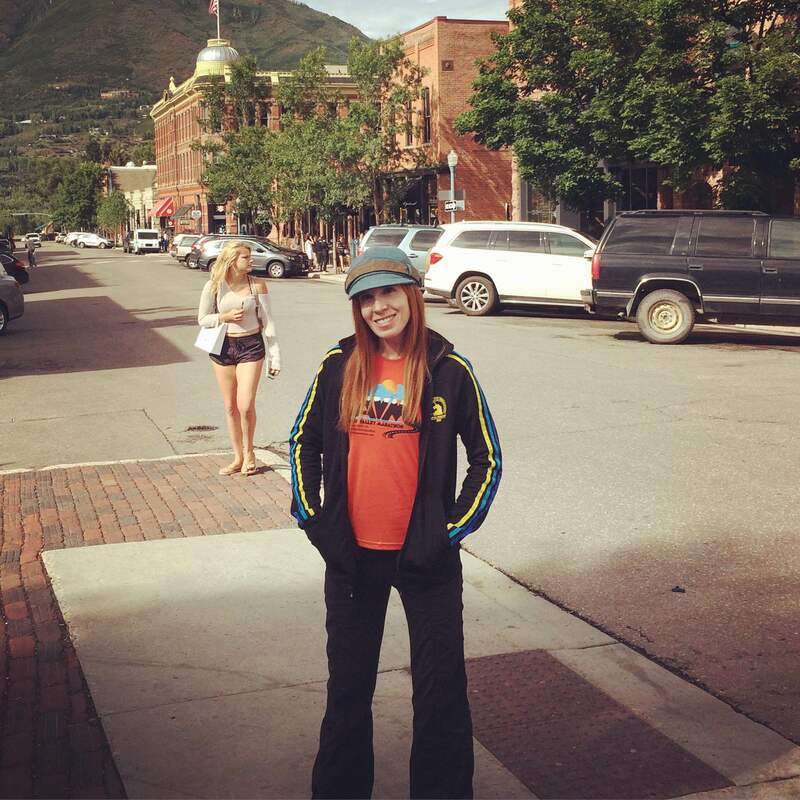 We started down the cobblestone streets of Aspen’s main shopping district and wound through neighborhoods towards the Rio Grande Trail. I noticed that there were two girls running my same pace. The rest of the crowd around us were guys. Just two?? Wow, okay, that was a good sign. A podium finish might actually be attainable. However, I decided before the race started that while being in the top three female finishers would be awesome, I would run my race and not try to keep up with the girls running by me/in front of me. One of the girls got a pretty good distance ahead and I let her. Then the next girl pulled in front. What was concerning at this point–a mile or so in, was that my legs felt weak. Tired. I recognize what tired legs feel like because I have experienced days like that in training. Not good. I hoped that by mile 3 they would wake up, but they still felt weak. I knew I was going to have a battle ahead of me in this race. Not against these girls, but against myself and my goals. The other disturbing factor was altitude. Even though Aspen is 2,000 feet higher than my training ground in Fort Collins, I thought I would be okay, but I could feel my lungs working harder than usual. The air felt thinner. The two girls seen here in this picture with me were with me for the first 14 miles and then dropped off. The girl seen in the front in this picture ended up grabbing the bronze medal for 3rd female finisher. The two girls and I played leap frog for about 14 miles and then just all of the sudden they were gone. One girl stopped to tie her shoe and I never saw her again. The other girl dropped back a little and I never saw her again. I just kept running my race. They were so strong for the first half of the race, I was really surprised that I never saw them again. The next water stops were fun, because people kept shouting to me that I was the first female. “Keep it up!” “Your the first female!” “Go!” This is was fun to hear. I was still doing okay at this point. I was meeting my splits. I wasn’t meeting them perfectly, but my average pace was showing that I was on target for a 3:21 finish with a 7:39 pace average. My husband grabbed this shot of me coming down the trail around mile 17. 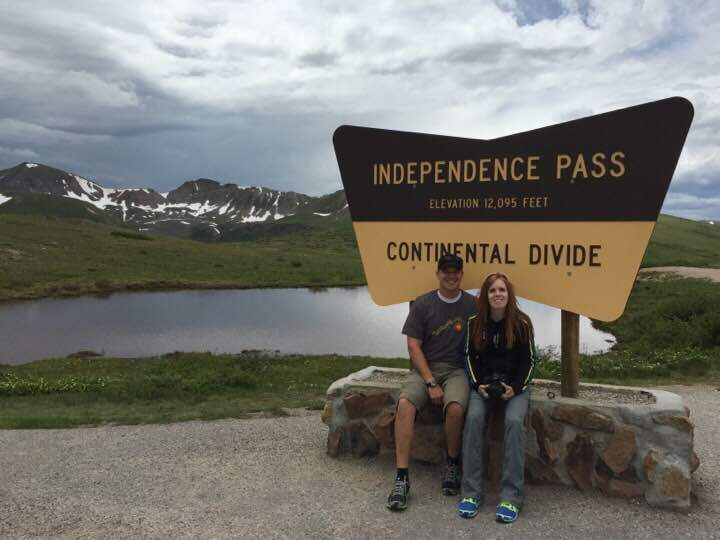 Around mile 17, my husband met me on the trail on his bike. He was excited for me for my first place lead, but I was really having to focus at this point. We didn’t talk. He picked up pretty fast on where I was and just cycled by me in silence. I didn’t want to sacrifice any oxygen or focus. The Rio Grande Trail reminds me of the Power Trail in Fort Collins. Very rolling terrain. A wide sidewalk path under your feet the whole way pretty much. That was surprising. Where was all that downhill I was expecting?! Some guy passed me around mile 18 and said, “hey, we’re almost there!” and that lifted my spirits substantially for some reason. Thanks, random stranger-racer-guy! It really is too bad that I wasn’t feeling strong that morning, because I was not enjoying the course or the run at all which is kind of sad. I mean, the scenery was probably beautiful, but I was so focused on just staying on pace and breathing that I hardly took the time to look around. This is very atypical for me and very different than my other marathons. Usually I am looking around, conversing occasionally with others by me and enjoying the race from the beginning to the end. Not here. No. I couldn’t wait for the race to end. I tried to find the “joy of the run” but just couldn’t that day. And after 2.5 months of training I wasn’t about to let myself just fall into an easy pace. I knew I wouldn’t feel any satisfaction from that at the completion of the race. My husband hung with me for a few miles and then he split off so he could meet me at the finish. A chart showing my goal splits (on the left) and my actual splits on the right). Somewhere around mile 21 or 22 my race completely fell apart. I hit the wall and I hit it hard. My legs weren’t cramping, but they just refused to turn around as fast as I wanted them to. You can see from this chart image what my splits were for the first 20 miles of the race and then the drastic turn towards the end. The left column are the splits I was trying to meet that were printed on my pace band. The right column shows you what my actual splits were and a little ways down you can also see what my average pace was up to that point. I was still on target for my goal up until about mile 21, but then. . .yeah. The Wall. Around this point, I was really feeling the heat, and I was just done. I really really wanted to walk. I haven’t felt this way during a run for more than a year, way back when I was training for my first marathon. I hate that place. It is not a fun place to find yourself at. But, but at the same time, that place is what keeps me respecting the marathon distance. 26.2 is a respectable distance regardless of how hard you train or how strong you may feel you are when you leave that starting line. There are so many factors to finishing a marathon how you want to. Every time I have met a course goal I know a little miracle has occurred. So, for the last 4-5 miles of the race I stopped looking at my pace watch, let that marathon goal time rest and just concentrated on not stopping. I mean, I glanced down a few times to see just how slow I was going, but for the most part the battle in my head was just to keep on going. I was sure that at any moment I was going to see those girls pass me, which was disappointing, I won’t lie, but I knew I couldn’t go any faster than I was and a win now seemed pretty impossible. But, I also knew any chance I might have at finishing in the top three required that I keep on moving; that I didn’t quit. Crossing the finish line. My actual finish time was 3:26:41 a little faster than the posted time here because that clock is for gun time, not chip time. (The girl right behind me was a half marathon finisher). When I passed the 25 mile sign, I started to perk up a bit. With every foot fall I knew I was getting that much closer to the finish. Usually, by now you have crowds cheering you on, but there really weren’t any crowds anywhere except at the actual finish for this race. When I rounded the corner and saw the finish line in sight I was pretty excited. I still kept thinking that one of those girls must be right behind me, but I never looked back during the race. I wanted to make sure I ran my race and mentally I just didn’t want to know how close they were! 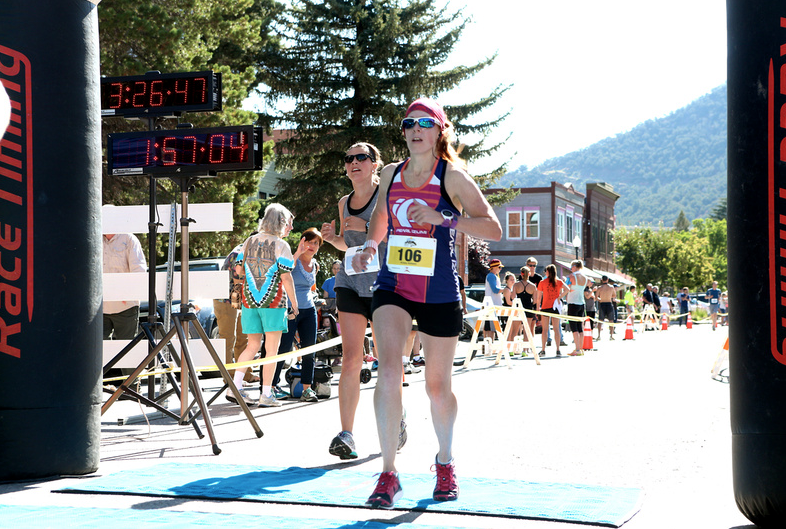 Crossing the finish line as first female was definitely overshadowed by my desire to just stop running, but it was still very cool to hear them announce that I was the first female marathon finisher. 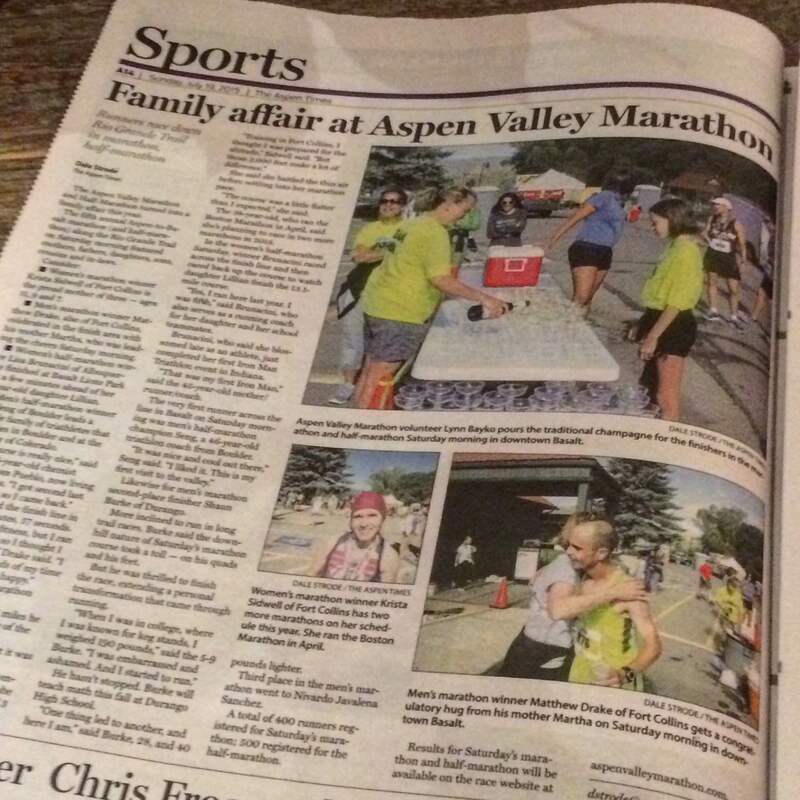 Shortly after hugging my husband, we were met by a guy from the Aspen Times who interviewed me and took my picture. That was a surreal moment. Several people that had seen me on the course came and congratulated me. It was fun to have a little “star” moment. After downing some water, we headed to the massage tables. I FaceTimed with some excited children of mine and their grandma. That was the highlight of the morning for me. They were so excited about my accomplishment. My son kept throwing out insane figures for the prize money he thought I had won. (He had learned the winner of Boston received 150k so he was really grabbing at some high numbers there.) That was a fun moment. Being a winner in their eyes is what it is all about. Being able to be an example of not quitting even in the face of something really difficult was a great take away from that race. Wearing my gold medal after the awards ceremony. 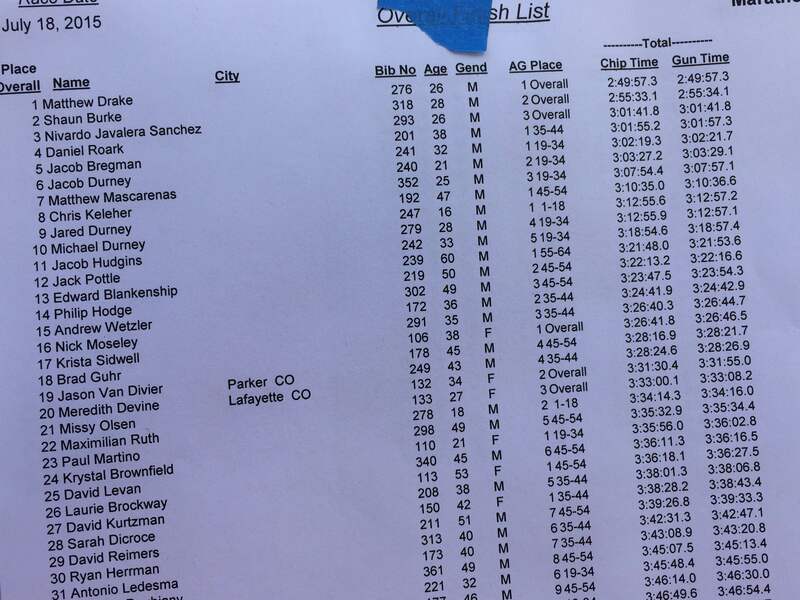 Race Results. I placed 17th overall. After the race, I still had quite a bit of race adrenalin in me and couldn’t sleep even though it had sounded nice after a long hot soak in the hotel tub. The soreness hadn’t really set in so we decided to get an early dinner and cruise around Aspen. 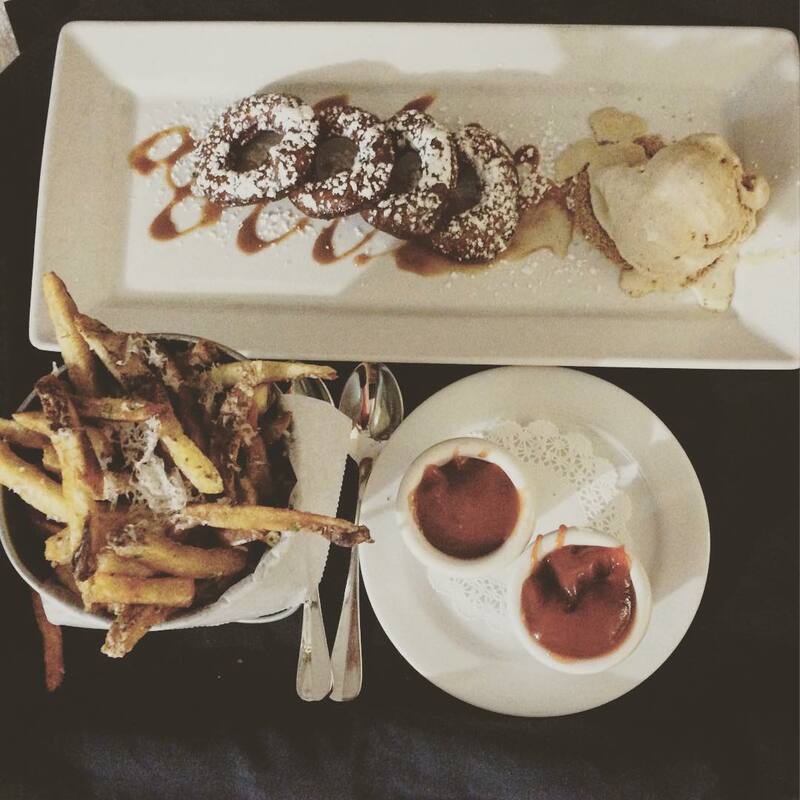 Truffle fries, salted caramel donuts and ginger ice cream. After seeing as much of Aspen as we wanted that day, we returned to the hotel for a long soak in the largest hot tub I have ever seen–which felt heavenly. We then decided to visit the hotel restaurant even though it was like 9:00pm. (When you eat an early dinner and are low on sodium and sugar, you order truffle fries and salted caramel donuts with ginger ice cream and eat them on your hotel bed.) I slept pretty well that night. 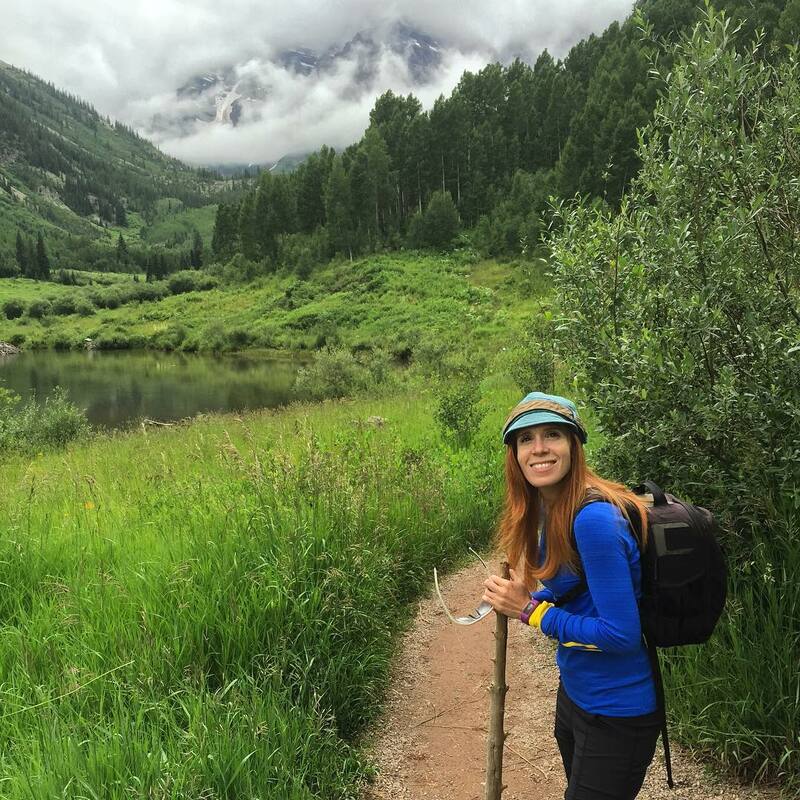 Hiking near Maroon Bells Lake. That walking stick came in handy on the descent!! Hiking up towards Crater Lake. The next morning, I awoke feeling like someone had beaten my legs with a bat. Moving them around seemed to help work out some of the soreness, but I really struggled going down stairs. It was comical. A rainy-day Aspen kept our Sunday activities pretty mellow which worked out pretty well for my thrashed legs. 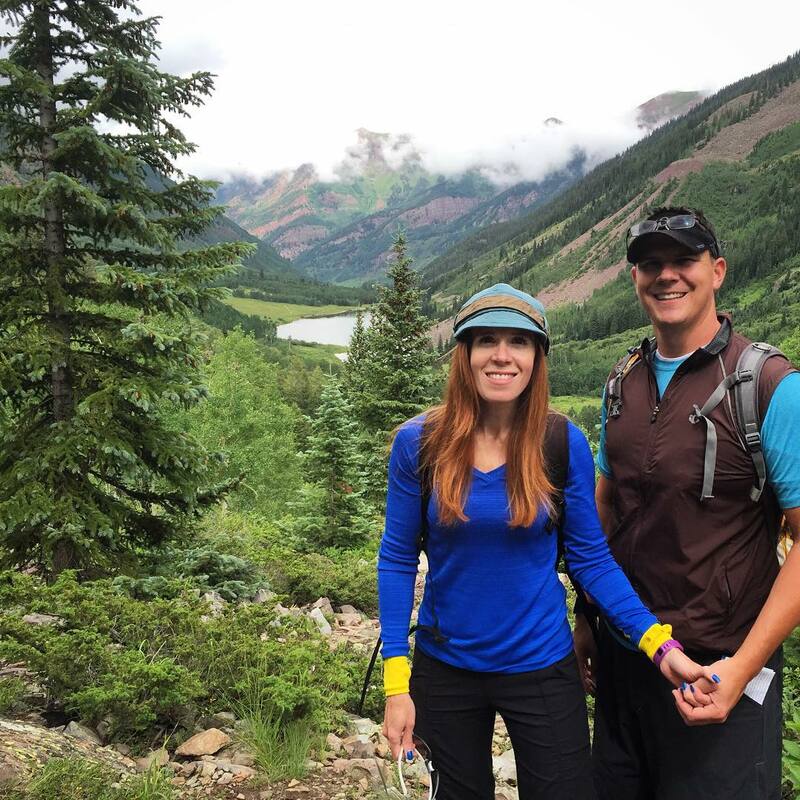 When the rain finally subsided, we went up to do some hiking in the renowned Maroon Bells. That was painful at times, but definitely worth it! Over the past week, my son has been broadcasting my results to pretty much everyone he sees. It touches my heart to see him so proud of me. As much as I disliked this race, it taught me so much about the power that is within all of us to succeed regardless of how the outlook may look to us at the time. I’ll learn from this one, and take what I have learned to the next one in September.